Expense Ratio – A fund’s annual operating expenses, which includes management and distribution fees, and are deducted from a fund’s assets or charged to all shareholder accounts. Brokerage Commission – Fee paid to a broker for a trade transaction. Many mutual funds are available without commissions and are known as No-Transaction-Fee (NTF). ETFs, on the other hand, trade on an exchange and investors have to pay a transaction fee. Bid/Ask Spread – ETFs are traded on an exchange and are quoted with a bid/ask spread. This is the amount for which you can buy or sell a security at a given time. This spread can vary greatly with the amount of activity, or liquidity, for a specific ETF. The spread may also be affected by changes in volatility of the overall market. Mutual funds need not worry about this as they do not trade on an exchange. Premium/Discount – Mutual funds trade after market close at their end of day Net Asset Value (NAV). Since ETFs trade throughout the day, their price may deviate from NAV due to market supply and demand mechanisms. This is an important implicit cost as prices can significantly deviate from their NAV in times of market stress. Shareholder Activity – When shareholders buy or sell a mutual fund, there are trade transactions within the fund which represents an implicit cost for the Mutual Fund. 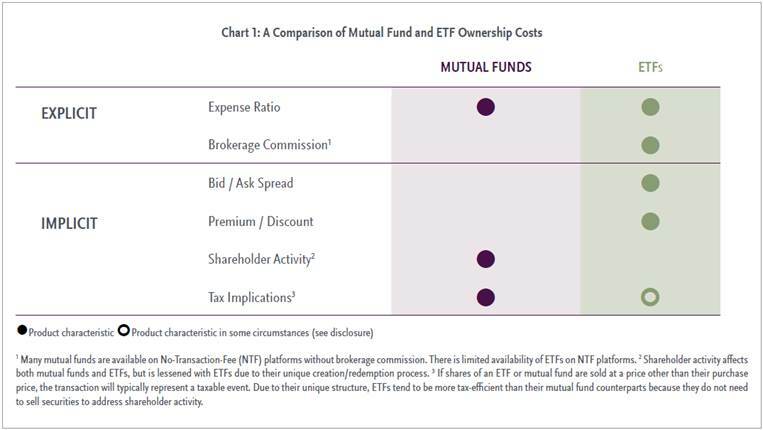 Tax Implications – ETFs tend to be more tax-efficient than mutual funds due to the unique structure of an ETF. Specifically, ETFs do not need to sell securities to address shareholder activity which represent taxable events.